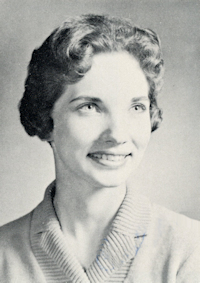 Obituary – Warminski, Carolyn Ann (Stieferman) « Perry High School Alumni Association, Inc.
﻿Band ’58-’61; Band Queen ’59-’60; Glee Club ’58-’61; Girls’ Trio ’58-’60; Girls’ Quartet ’60-’61; Teen Town Council ’59-’60; Teen Town Treasurer ’60-’61; Student Council ’59-’60; Home Room Vice President ’58-’59; F.T.A. ’59-’61; All School Revue ’58-’61; Christmas Vespers ’58-’61; Singorama ’58-’61; Girls’ State ’59-’60; Class Secretary ’60-’61; Band Secretary ’59-’60. Carolyn Ann (Stieferman) Warminski, 45, of 8215 W. Murdock, Wichita, Kansas died Saturday, March 11, 1989. Born to Leo B. and Pauline Stieferman on July 9, 1943, she graduated from Perry High School in 1961. She taught at Christ the King Catholic Church in Wichita. Survivors: son, Kevin, daughter, Christy, both at home; mother, Pauline Stieferman of Perry, Okla.; brothers, Lowell Stieferman of Oklahoma City, Robert E. Stieferman of Tulsa; sister, Mary Jane Gore of Lewisville, Texas. Rosary 7:30 p.m. today, service 10 a.m. Tuesday, both at St. Francis of Assisi Catholic Church; graveside service 4 p.m. Tuesday, St. Rose Catholic Cemetery, Perry, Okla. Memorial has been established with the American Heart Association. De Vorss Flanagan-Hunt Mortuary.